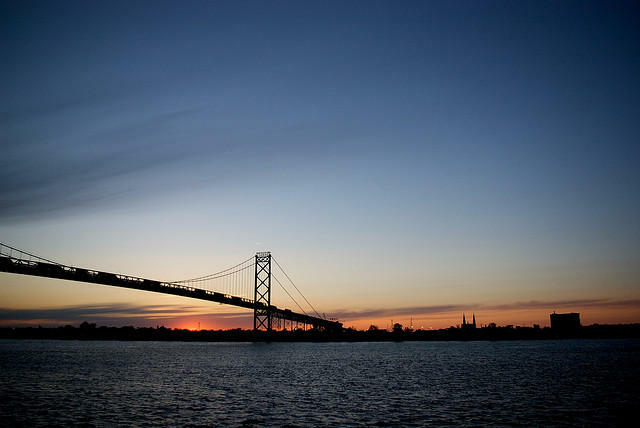 The owners of the Ambassador Bridge are waging a multi-million dollar ad campaign against a second, publicly-owned bridge. 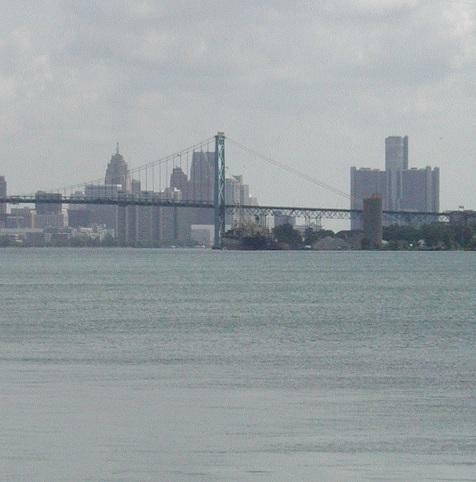 State Republican leaders say they hope to move forward in October with a proposal to build a publically owned second bridge between Detroit and Canada. Lieutenant Governor Brian Calley says a second bridge would benefit businesses throughout the state. "Those entities that make things here, be they automobiles, furniture, chemicals, cereal or baby food or even Slinkys, all these things we make in Michigan, and agricultural products as well, Canadians buy more of that than anybody else in the world," said Calley. He says a publically owned bridge that connects major highways on both sides of the river would keep exports streaming into Canada from Michigan. Calley was on Mackinac Island over the weekend for a Michigan Republican Party conference. He lobbied for the bridge project while there saying the bridge project is a conservative one that will be attractive to Republicans and Democrats alike. The proposal has been unpopular with some Republicans who think a second bridge should be built by a private company. The owner of the existing bridge in Detroit was also at the Michigan Republican Party conference on Mackinac Island to try to influence lawmakers oppose a publically owned bridge. Calley says he and Governor Rick Snyder are not deterred by campaigning against the project by the company that owns the existing bridge in Detroit. "[We're] making very steady progress and feel good about the track that it's on right now," said Calley. "It's really always been more a matter of getting through all of the garbage on the TV ads, and simply articulating what the proposal is." Calley says one of the biggest hurdles they face is countering the influence of the multi-million dollar ad campaign. 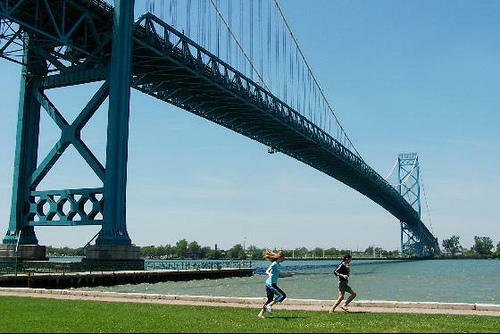 The campaign is paid for by the owners of the existing Ambassador Bridge. A report from the Anderson Economic Group has offered some clarity to the debate over a new international bridge crossing between Detroit and Windsor. Governor Rick Snyder has been pushing the idea of a new bridge two miles south of the Ambassador Bridge, known as the New International Trade Crossing (NITC). It would connect up I-75 and Highway 401 in Canada. The Ambassador Bridge owners, the Detroit International Bridge Company (DIBC), don't want competition from another bridge. Owner Manuel "Matty" Moroun has been fighting against the proposed bridge with a $4.7 million television ad blitz. The ads say Michigan taxpayers could be on the hook for the costs of the New International Trade Crossing if plans don't pan out. Moroun is proposing to build a second span next to the Ambassador Bridge to ease congestion. The report from the Anderson Economic Group analyzes both proposals (NITC vs. DIBC). The bottom line of the report from several media reports out today is that the new bridge (NITC) would ease congestion currently felt at the Detroit-Windsor crossing, and a second span of the Ambassador Bridge would not (DIBC). It's finding no. 2 in the report. 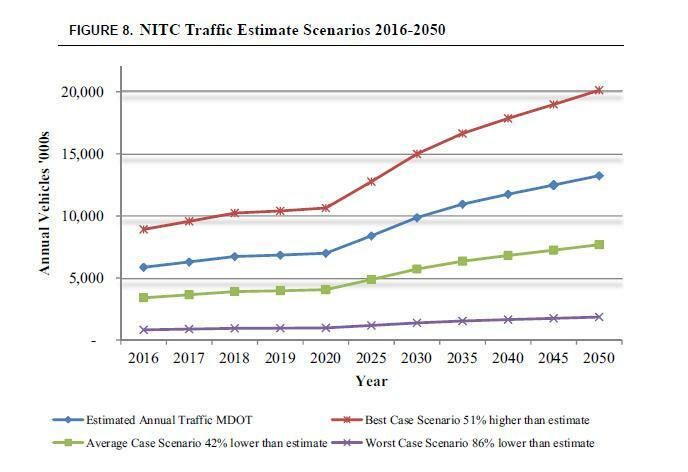 The Detroit International Bridge Co.'s proposed second bridge between Detroit and Canada would not eliminate the current congestion on both sides of the border but the New International Trade Crossing bridge would do so, according to an independent study released today by the Anderson Economic Group. A proposed government-owned bridge over the Detroit River, with additional U.S. Customs booths, would do a better job reducing border traffic congestion and handling future traffic than a second Ambassador Bridge span, says a new independent report released today. A proposed bridge two miles south of the Ambassador Bridge would alleviate border congestion, but a new span beside the Ambassador would not, according to a study released Tuesday. Finding no. 3 in the report states that the obligation to repay borrowed funds for the construction costs of either bridge does not rest with Michigan taxpayers. That finding assumes that protections for Michigan taxpayers are in place for "statute and bond covenants." Jeff Watrick over at MLive has a nice summary of the 7 findings of the report. Or you can read the report yourself. Let us know what stands out to you. Lt. Gov. Brian Calley is scheduled to meet with the Detroit City Council this afternoon to discuss a proposed new bridge that would span the Detroit River. Governor Snyder is pushing for the new bridge which would connect Detroit to Windsor, Ontario. Many state Republican lawmakers oppose the plan, known as the New International Trade Crossing. The owner of the Ambassador Bridge, which connects Detroit to Ontario, and is the busiest international trade crossing in North America, opposes the plan as well. He wants to build a new span of his own. Gov. Rick Snyder and many businesses want to build a new Detroit-Windsor bridge to aid passenger and commercial traffic. It would be backed by private investors, and Michigan would rely on $550 million from Canada for related improvements. It's likely Calley will use the meeting to try to gain support from the City Council for the New International Trade Crossing. Add the Grand Rapids Area Chamber of Commerce to the growing list of people, organizations hoping to see the rebranded New International Trade Crossing become a reality. Andrew Johnson is the Grand Rapids Area Chamber of Commerce’s Vice President of Government Affairs.